Sometimes they just appear magically. You put the album into the machine and out pops musical beauty. As in the beauty of Thurber or Monet or Mozart. This is the ethereal beauty of Crystalline Dream. 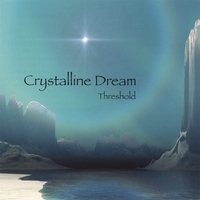 Their album Threshold is eleven cuts of exquisite music performed on flute, recorder, guitar and synthesizer and many other instruments of fancy. The musicians are Richard Ross and Korey Ross and they understand the musical feeling of flight. I don't think I have ever been more impressed with a first effort in recent memory. Their music is delicate, ephemeral and transparent and yet your feet stay on the ground. Your spirit however, will rise with the melodies to a higher sky then you’ve ever known. Threshold is the dream of Richard Ross. He says that it is in fact, eleven compositions of a continuous dream as it unfolds. The aerial theme is consistent throughout the recording and there is never a rough surface on which to scrape your sense of self. The opening cut is the title cut. Threshold is sad and haunting and there is a promise inside the melody. The mellisonant flute is a signal that you have reached the edge. But fear not. Your world is not exactly flat. You will not fall off. Instead you will be carried aloft into the dreams of your mind and guided into an aftertime of your desires. Come on, step over. Ethereal Gauze in the contemporary and perhaps futuristic rendition of Rued Immanuel Langgaard's "music of the spheres". Wind chimes combine with strong electronic waves of harmony. Like a dream state reflection, the music floats, falls, rises and whirls like planets revolving around a benevolent sun. You can hear the ebb and flow of energies like a celestial tide wave. This is one of my favorites. The trilogy Crystalline Dream is a succession of dream sequences that are somber in the beginning, yet fulfilling as the adventure takes place. Part One has moody brandishes of bass and oriental gongs that signal the passage of time and can not be measure by any known device. Part Two is drifting music that allows you to become aware of your surroundings, no matter where you are or where you are going. Finally, Part Three is the return to earthly boundaries and a sense of fulfillment. Everything you gave up on the journey has returned to you ten-fold. Taken as a whole this is the best cut on the album. Borealis is another remarkable track. Nothing is more natural or more mesmerizing than the electro-magnetic luminescence that is the focus of myth and magic. You can almost sense the rainbow glimmer of the northern lights as they dance across the darkened sky of your mind. And even though we, as a sentient race, know what causes the phenomena we are still happy to be enthralled by the sun powered atomic particles of color. Borealis is the delightful soundtrack that gives the dance life and light. One again the title track Threshold is reprised and the journey comes full circle. Like misty mountain clouds the music swirls and drifts around you like a halo and you can sense the feeling of security and comfort. Home again. There wasn't one tune that I didn’t like. Richard kept true to his plan and his theme. My mind opened to accept the journey, my dreams took shape, and as I returned they solidified into my own version of reality. I don't think you can ask any more of from the art of music. This one is going on my Top Ten list and frankly, I’m ready to go again.